Our family, including Renee from New York, went to Chicago last Friday (6/14) for Charna’s graduation: two days of special festivities. Friday’s presentation, a baccalaureate service full of school-spirit and college talent, was held in the huge, packed Rockefeller Chapel. Unfortunately we were seated near the back and had trouble seeing and hearing. In my tenure at the University almost no school spirit was ever exhibited, so I found this presentation somewhat strange. 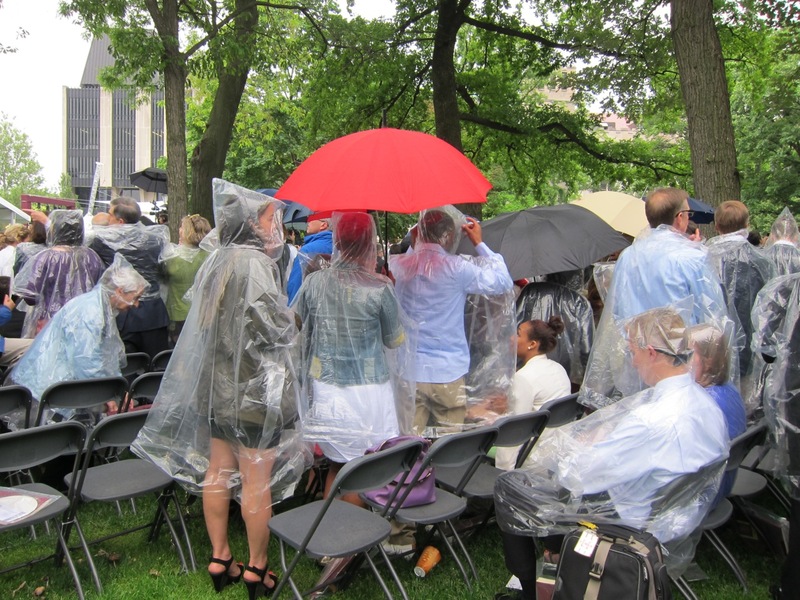 Twenty thousand people were seated in the main quadrangle on Saturday prepared to be rained on. The University has no venue large enough to hold the families, friends and graduates gathered together in one place. It wasn’t anything like I experienced when I graduated. My college class had 400 students, one of the smallest in the university’s history. This class had 1300 from the college and large numbers from the graduate and professional schools. The other difference, which I loved, was the great diversity of the participants. My college class had 3 African Americans and 397 white people, mostly Christian or Jewish. I don’t think there were even many Catholics. Today’s convocation had people from all over the world and Charna graduated from college (with honors), not like her old grandma who barely made it. After all the festivities the week became bittersweet, not with my usual nostalgia, but this time reality could not be ignored. My first visit was to Carol, who is now in hospice with lung cancer (and still smoking). Seeing her was a heartbreaking experience, only relieved by the presence my nephew and family, including my 10-month old great, great niece. She’s adorable, but the great, great part makes me feel very old. The remainder of the week was much the same. One of my friends fell about a month ago and is having a terrible time recovering. I spent as much time with her as possible, broken up with visits to healthy relatives in beautiful places and additional visits with Eli, Charna and Hannah, Eli’s committed partner. I like her a lot; hope she remains with him. On Friday I went to the Art Institute with Sandy. We saw a great photography show and all together had a fine day. 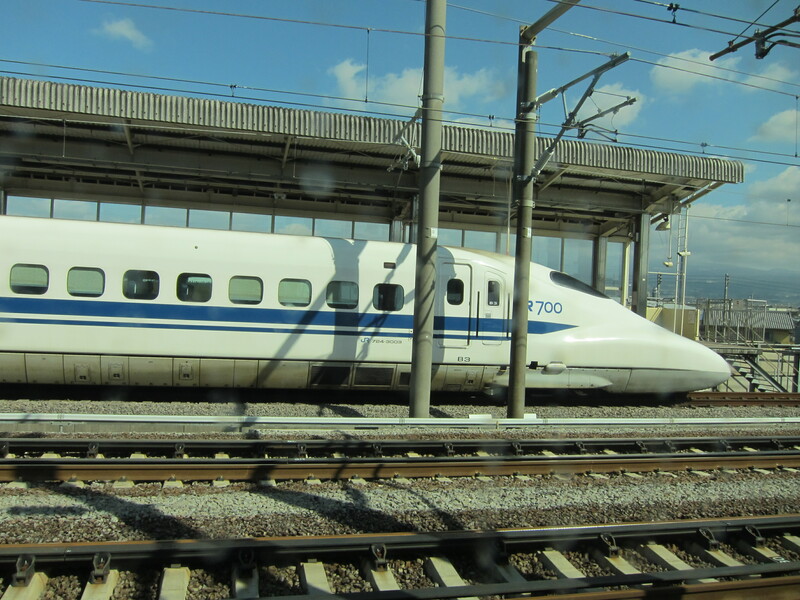 Shinkansen. Why can’t we have trains like that? Today is a travel day. First a brief trip on a local train, now four hours on the Shinkansen to get to Okayama. I think the distance is comparable to Chicago to DC. It wouldn’t be four hours on our trains. In this week since I left Pittsburgh I have stayed at three radically different hotels. My criteria for selecting hotels had to do with location and, of course, price, preferably under $100, better yet, under $75. Which was paramount depended on how much I understood about the destination. The first night, in Chicago, location was important. I wanted something close to the airport and to public transit. The O’Hare Inn and Suites offered seemingly constant shuttle service to the airport and the blue line train. It was not a great hotel; clean enough, but shabby with the inconvenience of stairs for second floor rooms and ; badly in need of renovation. The shuttle driver took my bags to the room and brought them down when I left. There was no way I would be able to manage it. I think this was one of the more expensive places. I have two bags: the largest 21” carry-on I could find, (Did you know the 21 inchers come in different sizes?) and the small overnight I took for that previous three night stay in Chicago. Dealing with both at once is not pleasant, but I don’t anticipate doing it often. I am shipping the larger bag and skipping hotels I will only stay at one or two nights. In Atami I had only the overnighter. My other bag is supposed to meet me in Okayama. 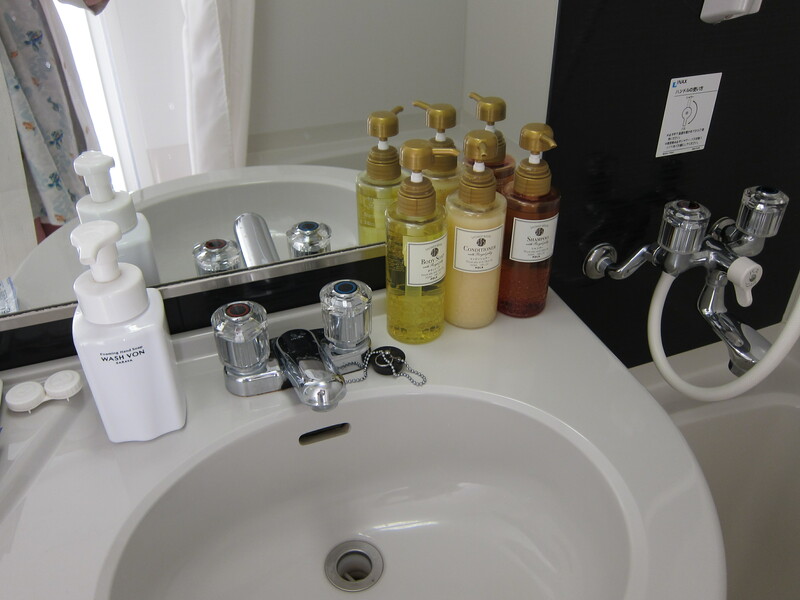 My Tokyo hotel, MyStays Inn, Asakusabashi, was stylish and looked new. The room was, as I expected, miniscule but comfortable. I think the bed was great but I was so exhausted every night I couldn’t say for sure. I had to put the suitcase on the bed when I wanted to open it. There was no room for one of those luggage stands and no closet. Three hangars were on a rod overhanging a full-size mirror. The bathroom, as most Japanese bathrooms, had a raised threshold. I’ve never figured out whether this enables them to flood the room to clean it or to keep the evil spirits from leaving the bathroom. The tub was deep, great for soaking but not great for getting in and out to shower. I never soak. Not anymore. That was the worst inconvenience. The staff was helpful; I was even able to manage with the ones who did not speak English. It was also convenient to the train. 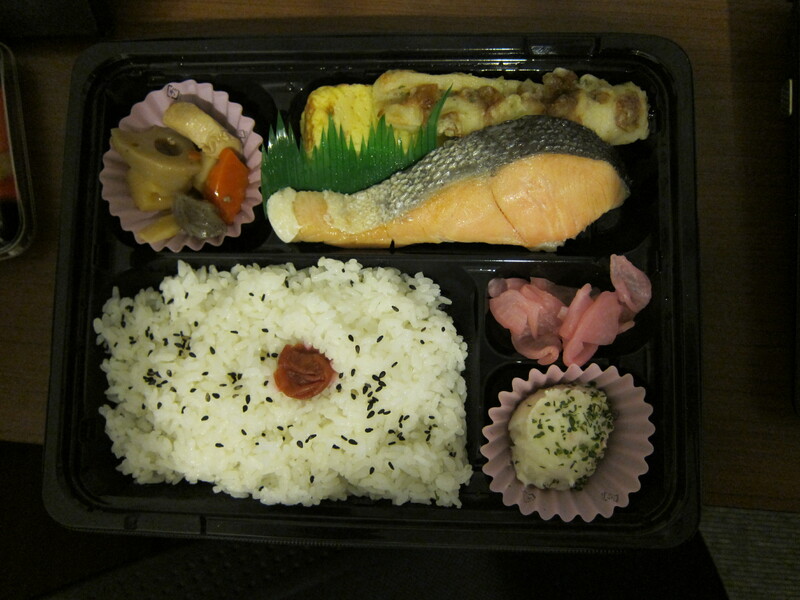 Bento Box, from the 24 hr. supermarket down the street. 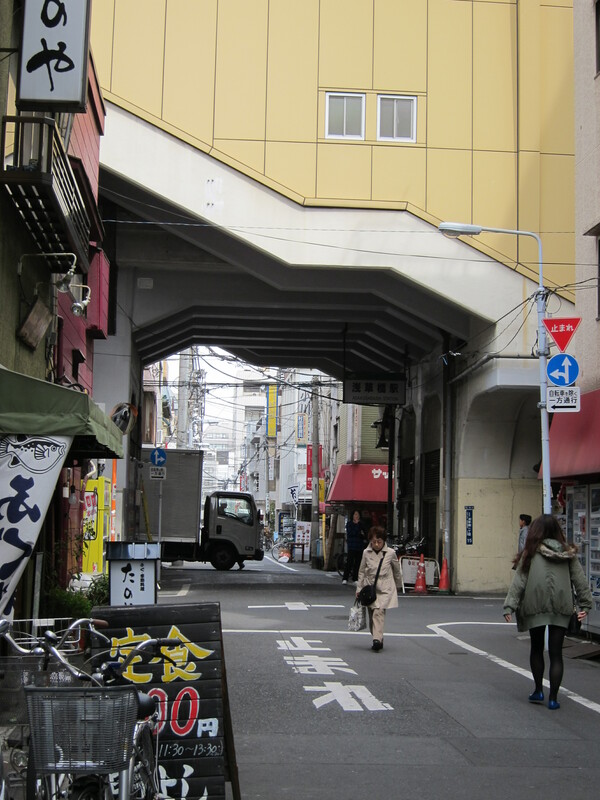 As you may have gathered, my experience in Atami was something of a shock. The hotel entrance at the bottom of the hill was hugely inconvenient. I come from flatland and don’t like climbing hills or stairs, up or down. But climb I did, taking taxis only when I was carrying the little suitcase, which was not light. I liked the room in spite of the lack of a comfortable chair. 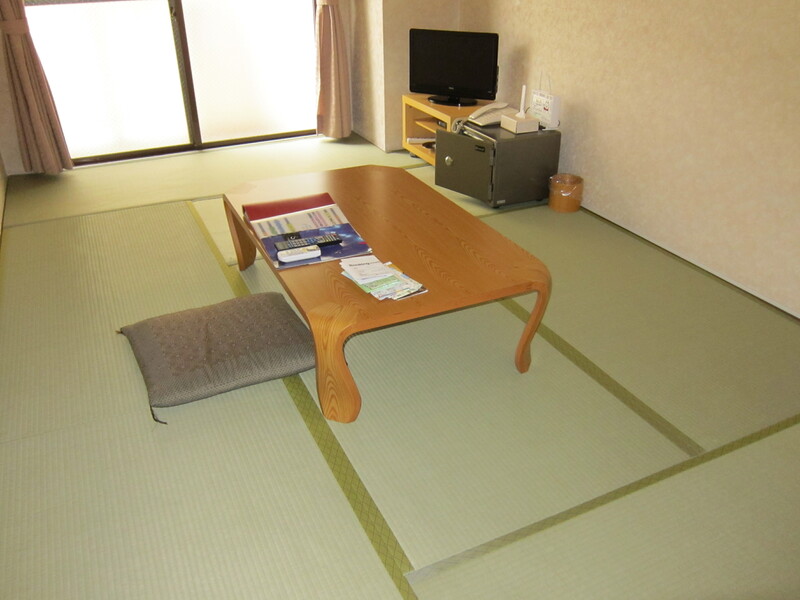 I like sleeping on the futon on tatami mats. I find it comfortable and I sleep well. Only the up and down is bad. The room was long and narrow. About a third of it, as you walked in, was lined on both sides with utilities: a tiny entrance area with a shelf where you can leave your shoes (no walking with shoes on tatami mats) and keys or whatever else you didn’t need inside the room. On the left were separate compartments for the toilet, the shower and soak tub; and a large storage cabinet entered from inside the room, for the futons, pillows and duvet. 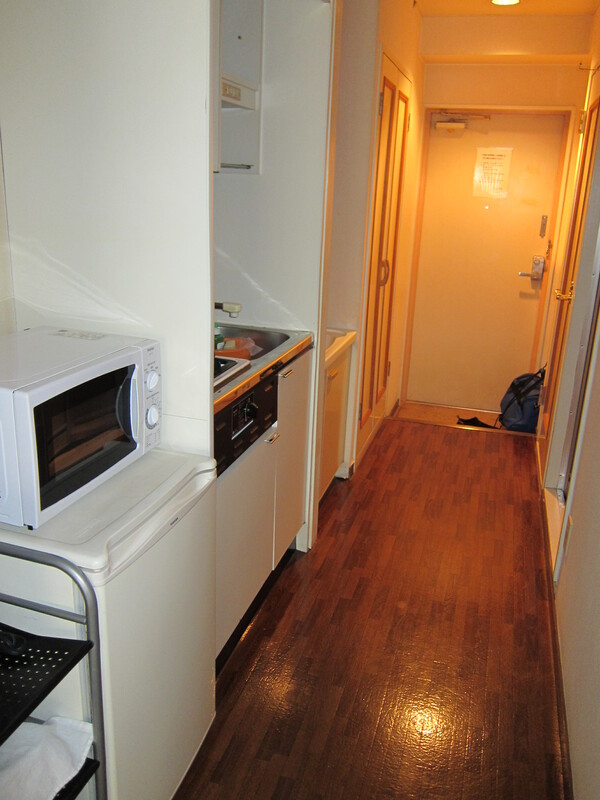 On the right side was a closet with a wardrobe, a basin with a mirror and some shelves in the corners for toiletries, a tiny sink and single burner stove with cabinet underneath with some dishes and pots, a microwave, a rice cooker and an electric kettle. No teabags, but I had some from the Tokyo hotel. I used the microwave, the kettle and a couple of plates for already prepared stuff I was able to purchase, including some tasty green stuff I hope was spinach. The actual room was fairly large with a TV and some shelves for other equipment and a large, sturdy table that I finally decided to sit on. I am amazed it took me 24 hours to figure I could sit on it. I just don’t usually sit on tables. The first morning I couldn’t get my support stockings on while sitting on the floor. I just don’t bend so much any more. I finally went and sat on the toilet, the only thing in the room that resembled a chair. I bought an Obi in Tokyo to cut up for a book cover. It’s a lot of fabric and it is heavy. I was able to get it in the suitcase, but as the weather gets warmer I will have to think about getting rid of stuff so I won’t have to wear the two jackets I am using now. I think it could get very warm here before I am ready to leave. Chicago was supposed to be cold the day I was there. I took a scarf and an undershirt that kept me too warm most of the time so I left both things I almost never wear in the hotel room. I have two pairs of shoes with me. Took a good look at the pair I was wearing when I arrived in Tokyo and decided they could go. First, I have to make sure I am comfortable in the other pair. I tend to walk on the outside of my feet and I break down most shoes before they ever wear out otherwise. Since I started wearing Merrell’s I find they wear on the bottom long before I can break them down. I never took a good look at the other pair. They could be awful, also, in which case I guess I go barefoot, or it might now be possible to buy shoes here. I’ve noticed some very large feet. I am also considering jettisoning the jackets. The outer one is probably thirty years old. It’s in amazingly good shape. Eddie Bauer made great stuff back then. The lighter one is also nothing special. I’ll have to see how much I buy and wait until the weather is really warm. Presently it has been fluctuating between very warm days and much cooler days. Also depends on altitude. On April 10 I will go to Mt. Koya, possibly a cold trip. I’ve got about 40 minutes left on the train. The weather forecast was for cooler temps, but it didn’t seem very cool before I boarded. Posted this from my hotel in Okayama where it is very cool, damp and gray. Originally planned to visit Korakuen, my next garden, today, but I hope tomorrow will be a better day. My suitcase, entirely encased in a plastic bag was waiting for me. I could get used to this kind of service. The flight to Chicago was uneventful. Returning to Chicago is always filled with nostalgia for me, and this time, a little shock. The airport in Pittsburgh is, unfortunately, a very quiet place, a little backwater. The organized chaos of O’Hare took me by surprise. My first feeling I no longer knew how to proceed at O’Hare was quickly dispelled as I realized I had arrived at Terminal 2 and had to proceed through an inside revolving door to Terminal 3 to get my bag. It’s been that way for years. Originally a military airbase, called Orchard Field, I think O’Hare had only 2 terminals when it first opened as a civilian airport. It was quite small and served as a kind of satellite to Midway, which was the original Chicago airport. My first flight, in 1953, was out of Midway in a propeller plane. While I was in college I would sometimes drive out to Midway with a date and we would we would park along a fence and watch the planes take off, and amongst other things, sit and eat doughnut holes, sold at an outlet store for some doughnut manufacturer I no longer remember that was on the way..
Over the years O’Hare grew to 4 terminals with a Hilton Hotel in the center. They enlarged it further by putting a tunnel under the hotel and more areas for passengers to meet or depart from ground transportation. This is the part that’s been really confusing to me, but this time I finally figured it out. I usually try to fly into Midway when I come to the city so I’ve had limited experience with O’Hare in recent years. So this was kind of fun. The hotel shuttle returned me to O’Hare and I took the blue line train to downtown Chicago and met the grandchildren, who are no longer children, along with one of my dearest friends and we all had dinner. This morning I again took the shuttle back to the airport and now I’m sitting on the plane watching the flight path on the little video. I had enough frequent flier miles to go business class both ways and it’s great. I love all the space. One more paragraph and I’m going to sleep. Finally got to the hotel and I can’t keep my eyes open. Good night. I can’t remember when I’ve watched so much television. I’ve also become enchanted with MsNBC. I didn’t have cable before I moved so never got to see them. Now I’m forced to have cable and they almost make it worthwhile. I’ve also become mired in sewage, actually, sewage and storm water. Pittsburgh has big sewage problems. The sewer system is old and inadequate and the city and/or county have been fighting with the EPA for years. They finally had to get down to business, maybe just realistic. They are proposing something like the deep tunnel system Chicago has been working on for some forty years: deep tunnels and a three BILLION dollar construction project. Even if the project is implemented basements and streets won’t stop flooding. The tunnel project will store the runoff from rains as little as 1/10th of an inch, and keep it from going into the rivers. In order to prevent flooding the city has to embrace green infrastructure: green roofs, rain gardens and pervious pavement. Of course, if this was done, we wouldn’t have a need for so much tunnel construction. So, as usual with complex problems we’ve opted for the simplest, costliest, but hardly the most effective solution. So what do I have to do with all this, besides trying to be a good citizen? Not much, really. I don’t have a basement that floods and I haven’t noticed my street flooding. The parking lot next to my building becomes a river when it rains, but it doesn’t affect me. I have a friend who is an environment lawyer and is active is attempting to implement green solutions. She’s been dragging me to meetings and my mistake was to start asking questions. This is probably the first of many posts about sewage. It’s actually a fascinating topic. I have to go to a meeting in 15 minutes. See you later. The sky was overcast with a slight drizzle all the way up here. That’s ideal for a long drive; no sun in the eyes, no huge downpour to cope with. We stopped at the Kohler Arts Center in Sheboygan and saw three interesting shows. 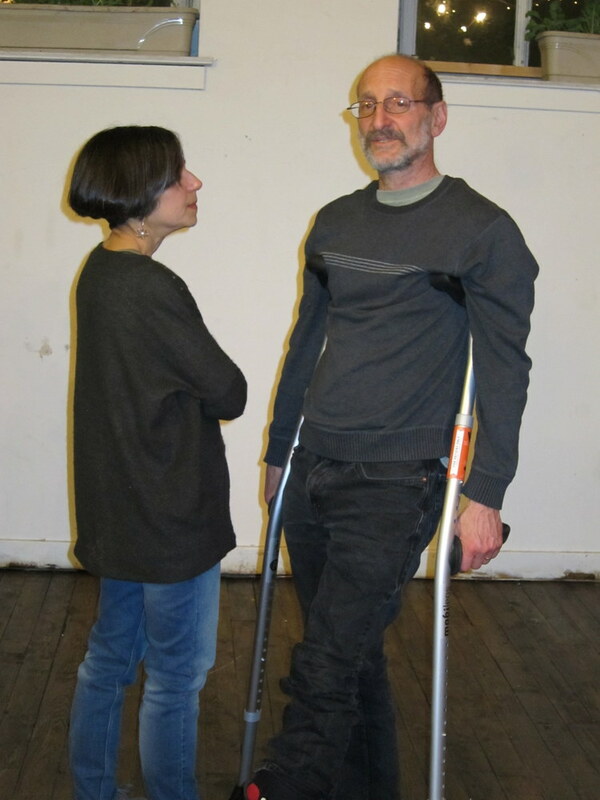 The drawing show and Carol Prusa show were both wonderful, but I particularly loved Emery Blagdon. He made what is frequently termed “outsider” or “”visionary” art: creations which come from the soul made by someone with no training who probably never terms them art or thinks of himself or herself as an artist. I would love to go around the world looking at this kind of art. After another stop for ice cream we arrived in Sturgeon Bay where Anita and Kathy were waiting for us and we will spend the week. I am sitting and writing and looking out at Lake Michigan and listening to the waves coming ashore. Lake Michigan could be an ocean; there are no other shorelines in sight. I saw it when I drove into Chicago and followed it several hundred miles to get up here. Yesterday we actually did some work. Sandy taught us about image transfer. Most of her techniques involved laser prints. I want to do it with inkjet prints and still haven’t found a satisfactory method. We have one more technique to try today. I have taken lots of photos and can’t properly sort and handle them until I return to Pittsburgh. 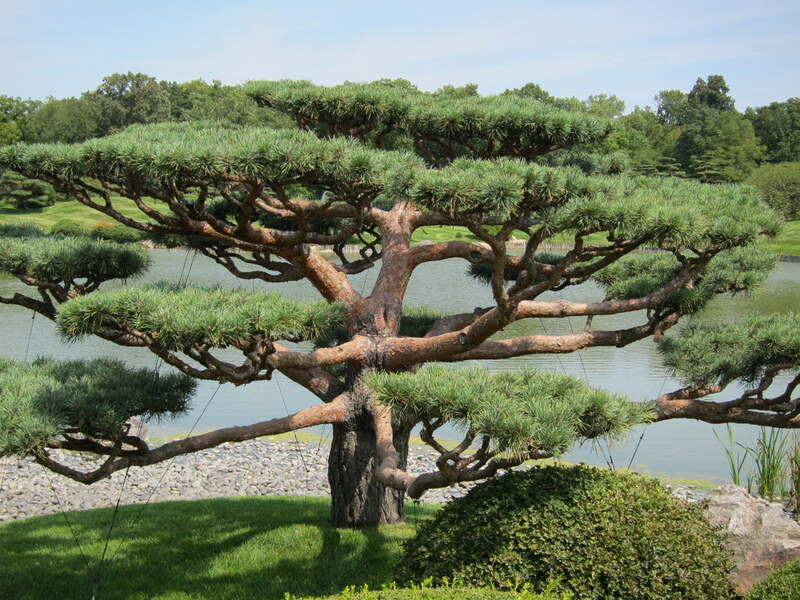 Here is one I took in the botanic garden just outside of Chicago. It was a great week. I saw 3 nephews (and 1 great nephew), 3 cousins, 2 grandchildren (1 two times and 1 three times), 1 friend twice (and much of her family), stayed with another friend, and friend #3 arrived Friday. All of this took place during 3 breakfasts, several lunches, 2 special dinners and far too much time in the car. But busy as I was, I felt wonderful. I have come to the conclusion that living in the whirlwind is good for me; I need all that stimulation. Today is the day we go to Door County. Someone else will drive and I am thinking about giving my eyes a rest and not putting in the contact lenses. Eventually, I do get tired.